I often peruse old newspapers. I do it because I desperately want to time travel, but know that this is the closest I will ever get. This weekend I went to Palm Coast’s main library to find out more about a defunct local attraction, Animal Land. Instead, however, I burnt a couple of hours delving into the history of Palm Coast through the ads and articles on microfiche of The Flagler Tribune. From what I can find out, the ‘Tribune’ was Flagler County’s only newspaper during its life from 1917-1981. And judging by the late ’40s editions, its 3 or 4 pages of farm reports and local accidents were never going to yield a Pulitzer Prize. But for a region where so little of past remains, and where so few people have lived their whole lives to share its history, it’s a rare and comforting glimpse of what once was. And in truth it’s not the articles, but advertisements that make the Tribune most interesting. 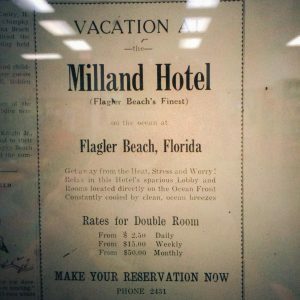 The featured image is a snapshot from 1947 promoting Flagler Beach’s allegedly finest accommodation: the long gone Milland Hotel. I spent a year in Flagler Beach. It’s charming, quirky, and a little run down; much like most of Florida. Yet the Milland Hotel advertisement reminds me of Flagler’s more illustrious holiday past, where for $2.50 a night, or $50 a month, you could “get away from heat, stress and worry.” If it strikes your fancy, just call the four digit telephone number and make your reservation now. Previous Post Sorrento Quay: Now and then. Next Post Urban Camping: Livin’ in your office, by Terry K.